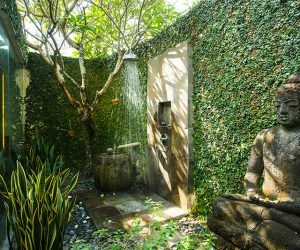 There's nothing quite as refreshing as a good shower, whether you're after an early morning wakeup, a midday rejuvenation, or a hot blast to relax the muscles after a long tiring day; standing under that strong stream of droplets just takes some beating. 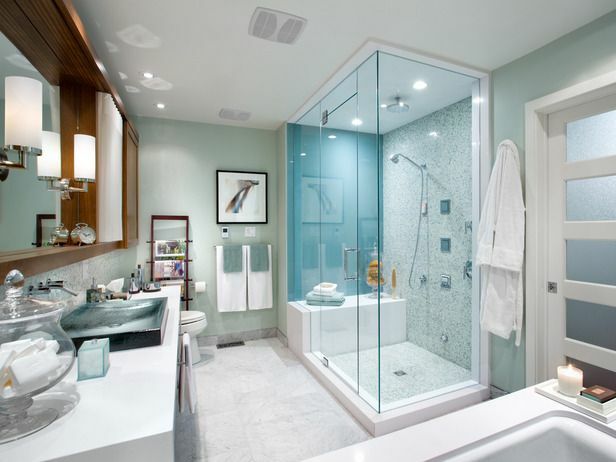 So with that in mind, don't our beloved shower rooms deserve an extra special piece of our attention? Of course they do. 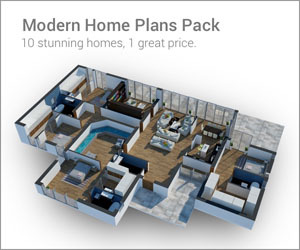 Forget about the standard meager sized shower heads that dribble out an apologetic and spluttering jet, and the bog-standard off-the-rack cubicles that imprison you in their boring surrounds. 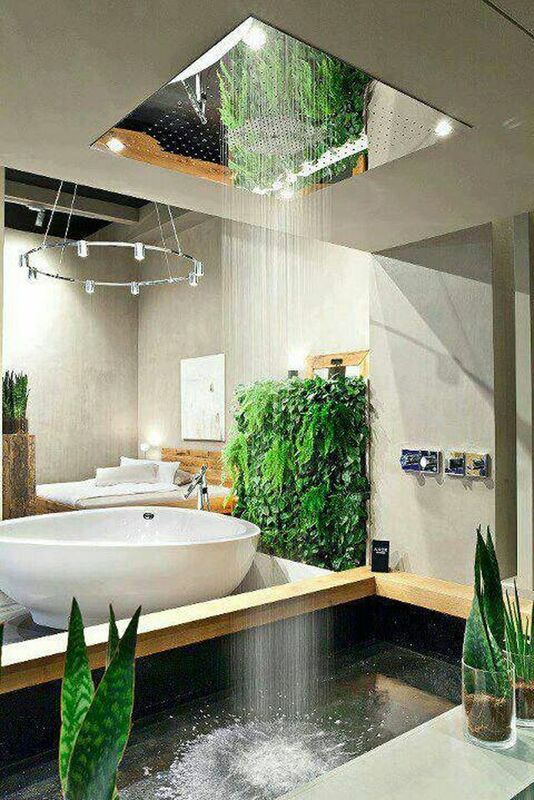 We are talking about the world of wonderful waterfall shower heads that drench us in a soothing downpour, open plan settings that are inspired by nature, and just plain gorgeous shower room designs. 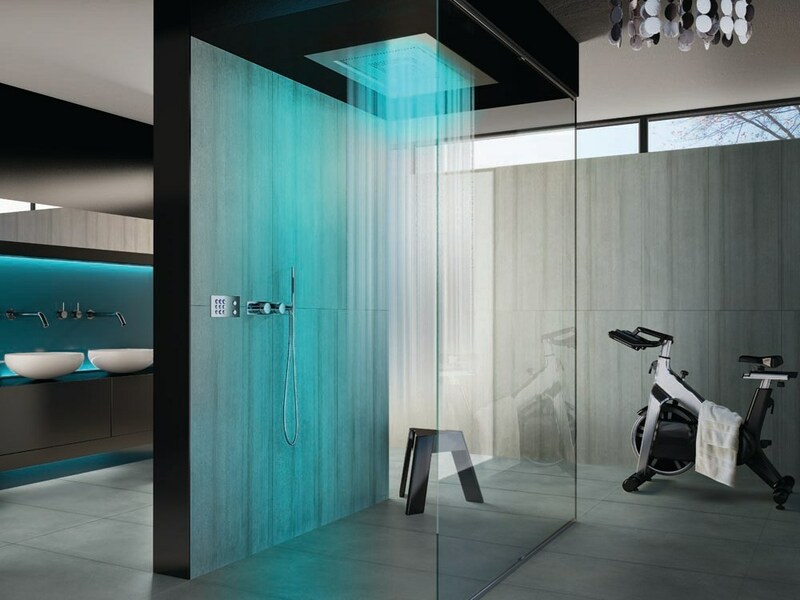 Not everyone has the luxury of an enormous shower room like the one pictured here, but that doesn’t mean that we can’t take inspiration from its striking décor. Large slate gray tiles look great even in a small room, as large tiles generally increase the look of space in confined quarters. In this example, striking color is washed over the top of the sombre ceramics in the form of bright blue LED lighting. 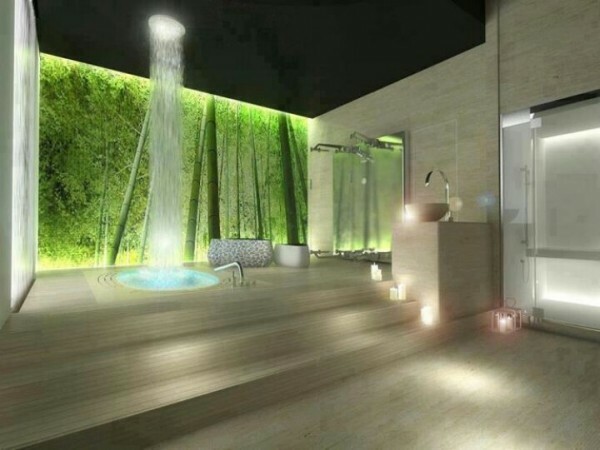 LED lights are great for use in bathrooms, and programmable sets will even allow you to change their color to suit your mood or the time of day. 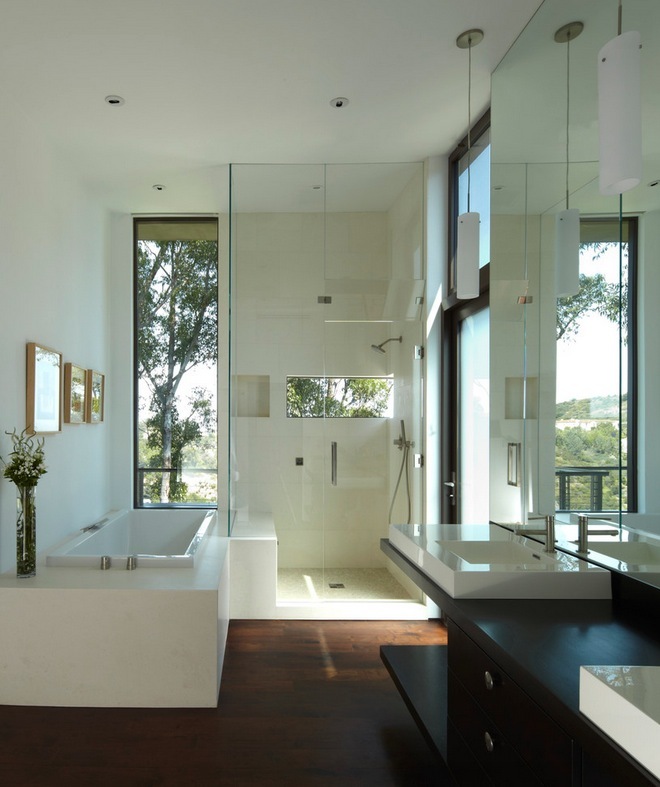 There’s nothing quite as liberating as taking a shower in the great outdoors, but if your location or typical weather forecast doesn’t allow this luxury, then how about one of these dual aspect windows that look both out and up, forming a cutaway of your room for an outdoor effect. This master suite really has it all: a serene sleep area, a walk-in closet, and a truly enormous shower taking center stage. 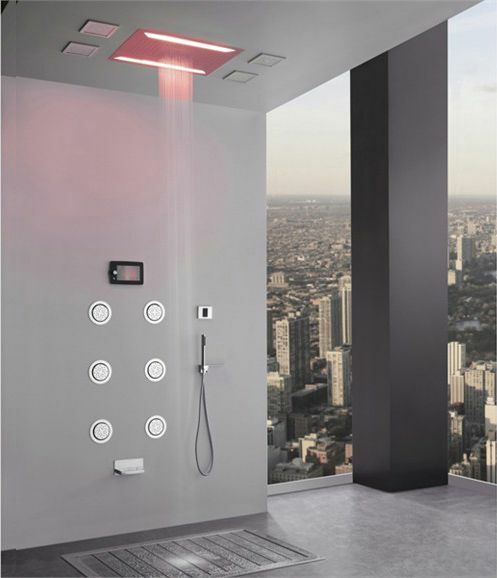 Another great application of LEDs make this shower room stand out, but lets hope the inhabitants of the next skyscraper over don’t own binoculars. 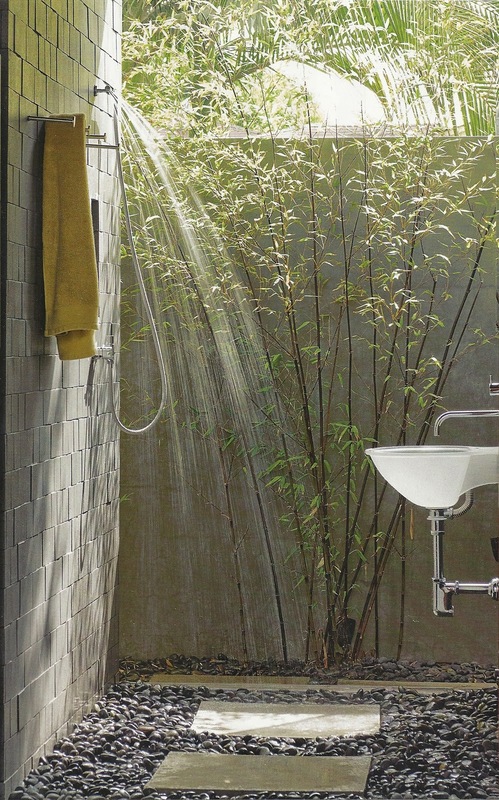 Admittedly this shower head is of minuscule proportions, but just look at how serene it’s sun dappled surroundings are. Another beautiful open air bathing area–though you had better be good at stepping stones if you forget your flip-flops, journeying in and out of the tub over that harsh pebble floor could be painful! 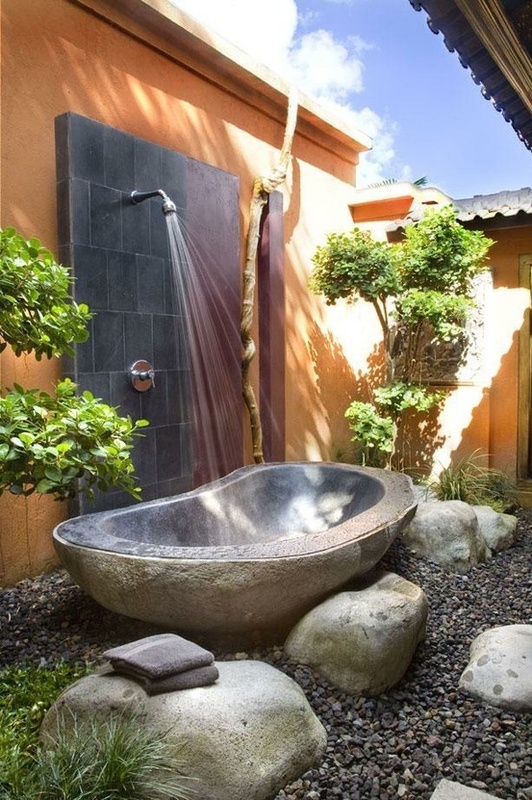 This has got to be both the prettiest and most practical solution to outdoor showering, incorporating a softly sweeping decked walkway that is privately shrouded by nature itself. 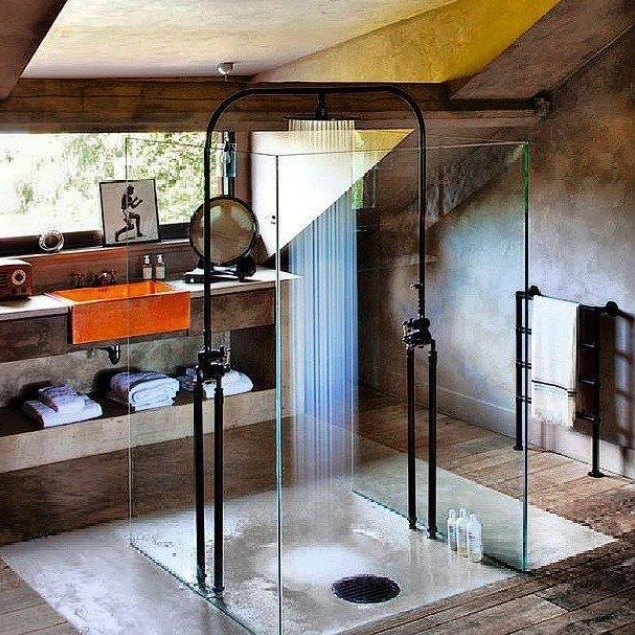 There is even a handy place to perch your shower potions, perfect. 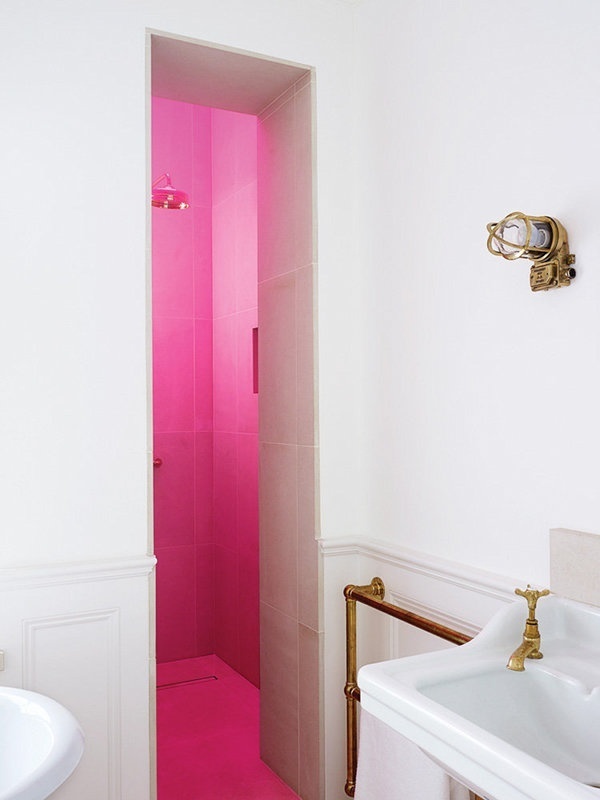 This traditional room receives a blast of modernity in the form of a vivid pink pop. 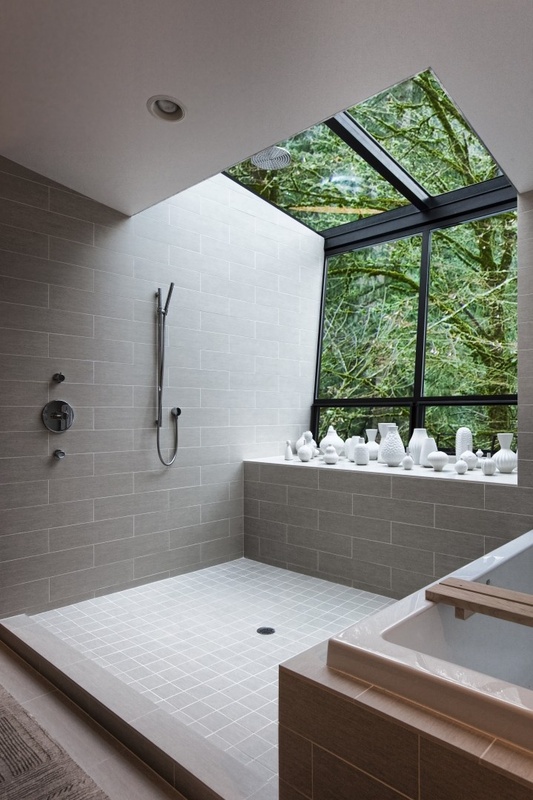 This unusual layout gives the shower its own stage. 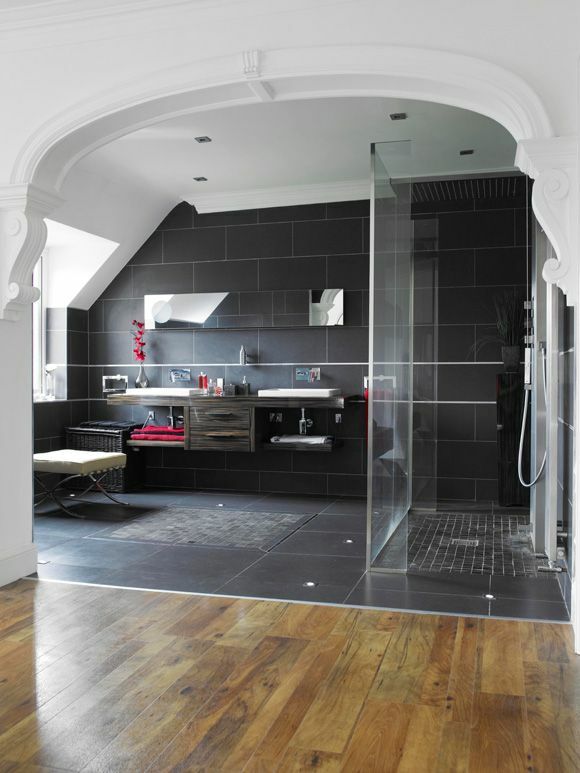 A bespoke shower screen results in a seamless look in awkwardly shaped rooms with sloping ceilings. Drama can be created within even in the most simplistic décor. 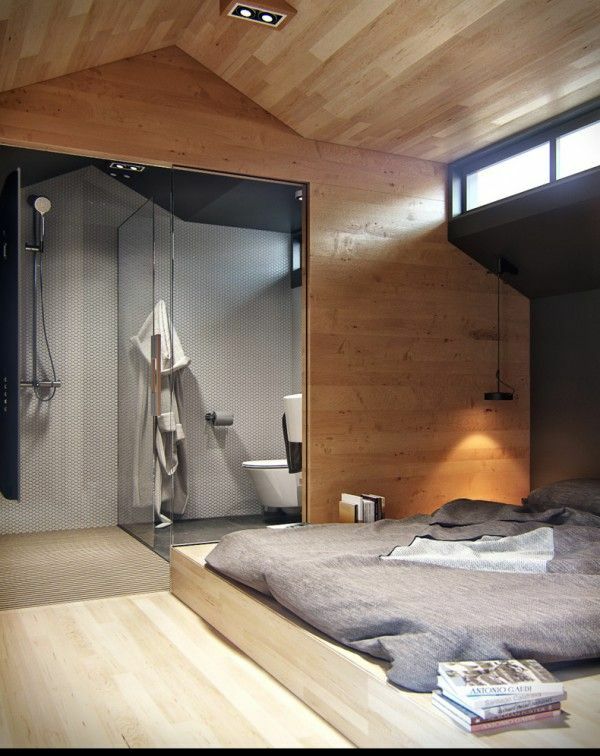 Open plan en suites make bathing a fluid continuation of the everyday bedroom based dressing regime. 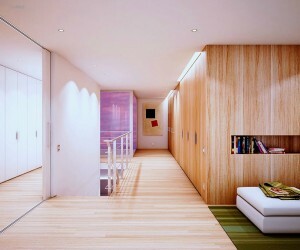 Another stylish open plan en suite. 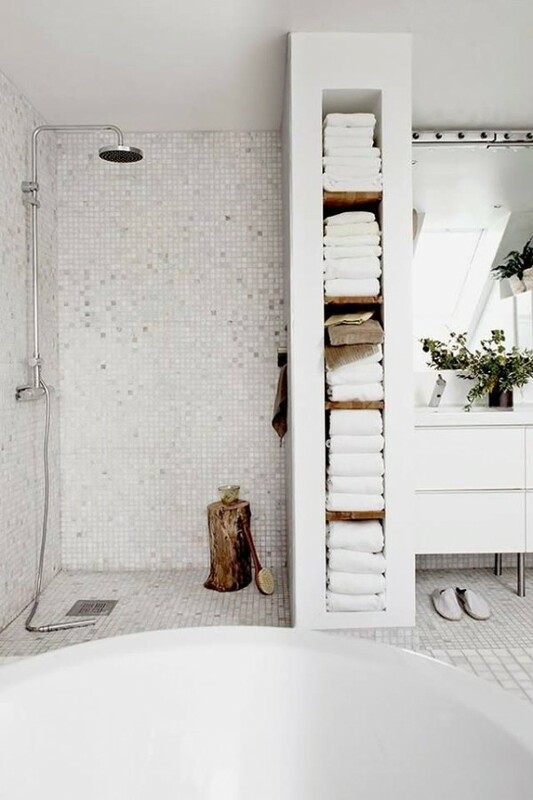 Don’t forget the towel storage! 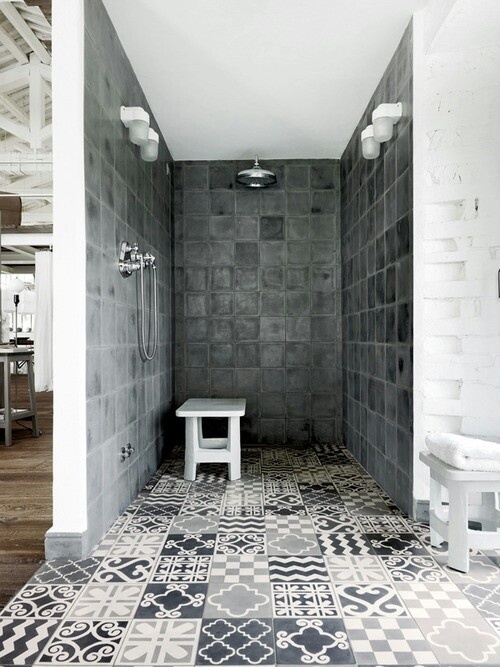 These patterned tiles provide an eye-catching contrast against plain wall tiles. It’s an unusual choice but the gamble really pays off in creating a superb stand-out scheme. 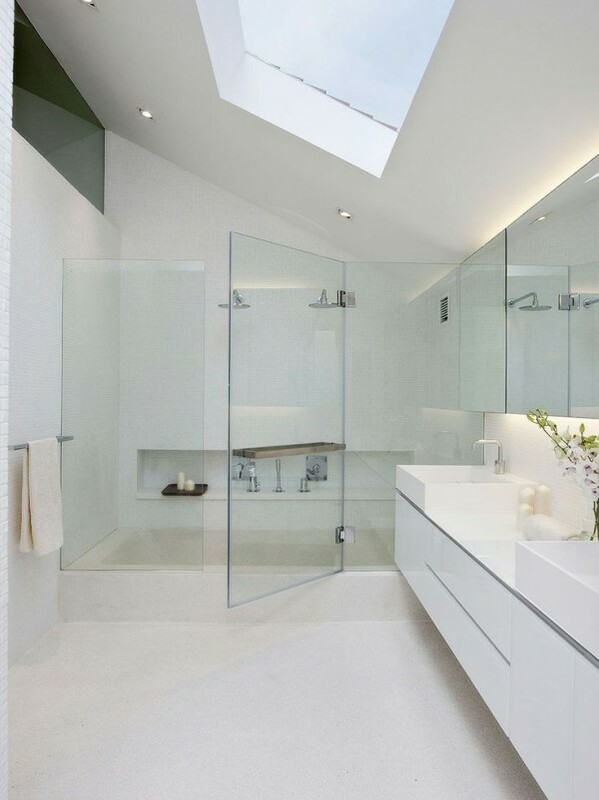 Plain white schemes will look luminous under a generous skylight. 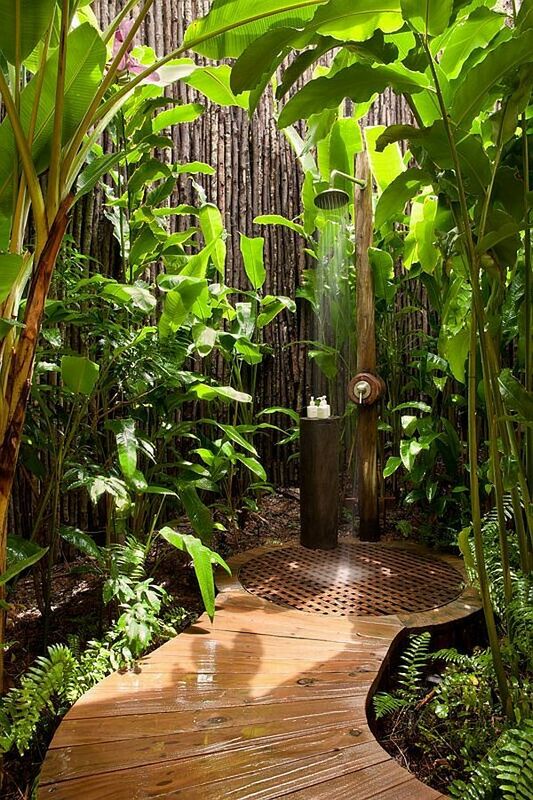 A head-height sliver of nature gives an attractive view from this shower cubicle. 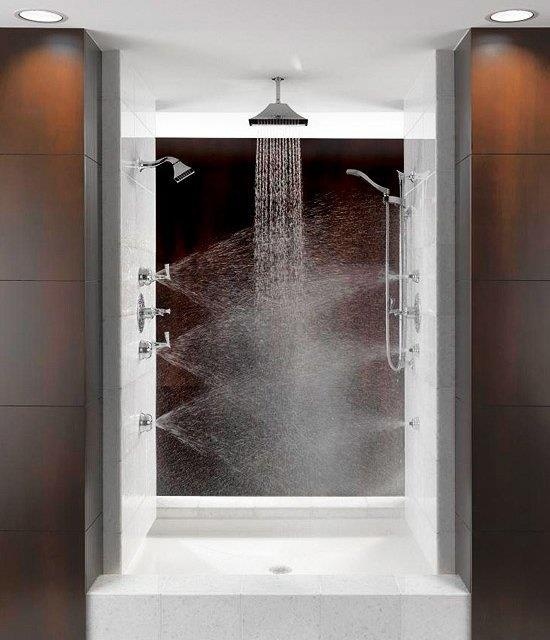 Over tub showers can be walk-in too. 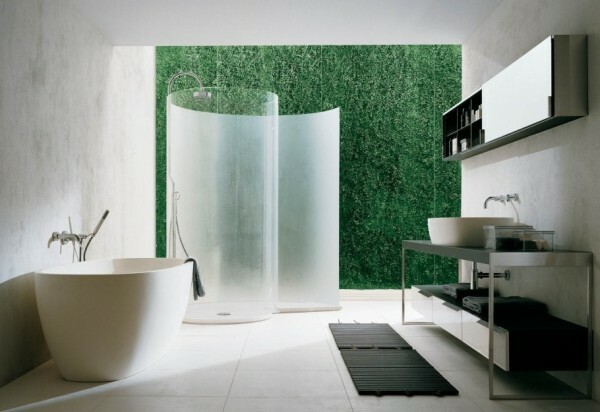 A swathe of mosaic tiles cover the shower area over and around this sunken bath tub. 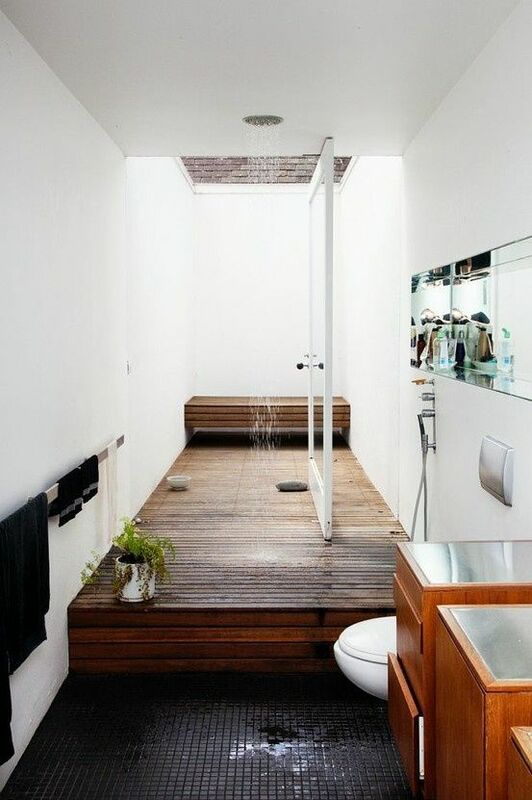 An in-shower bench provides a handy shelf space. 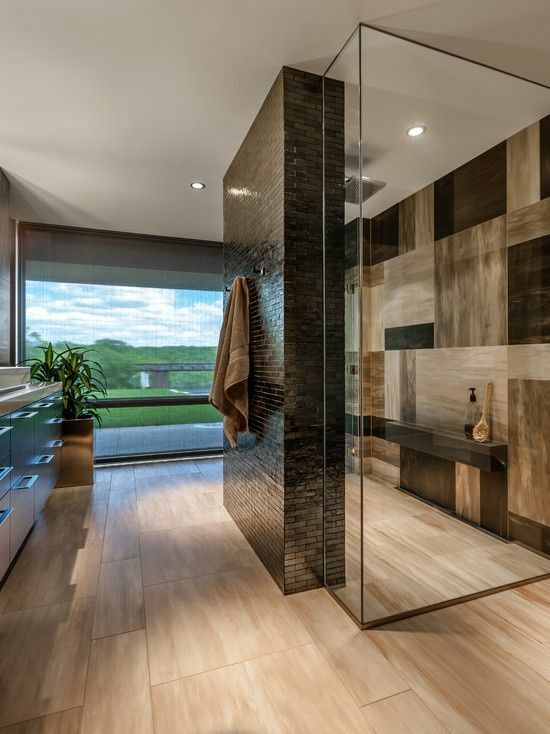 A stunning irregular checkerboard effect has been achieved in this shower enclosure by teaming different shades and cuts of the same tile material together. 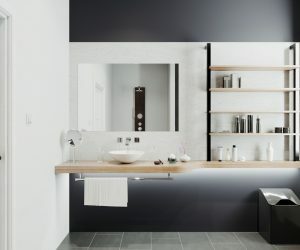 An extruded shelf fits perfectly with the look. A bit like a human car wash, only you have to soap yourself. How about a futuristic pod shower? 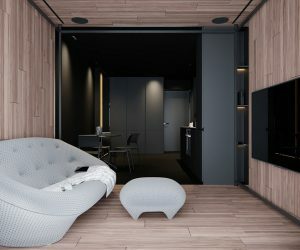 One nature inspired feature wall breathes life into this plain white scheme. 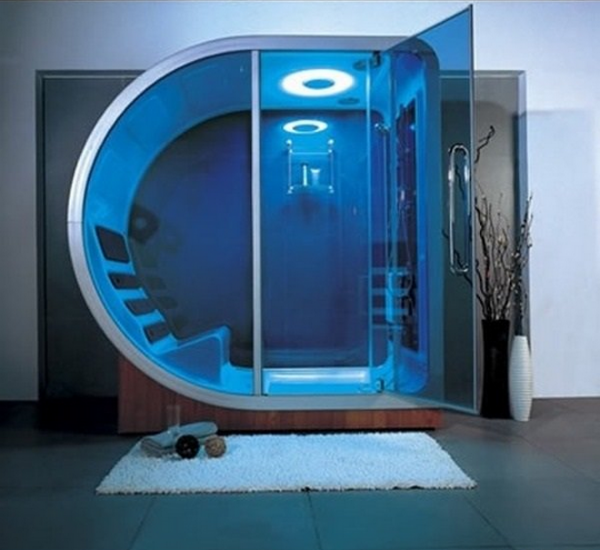 This looks like something out of the Starship Enterprise transporter room, beam me up Scotty! 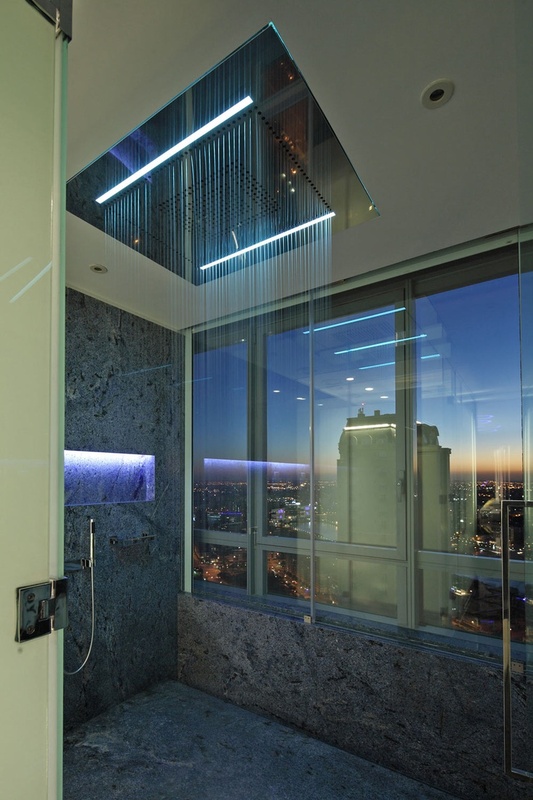 Not a bad view from a shower cubicle–though you could feel a little exposed. 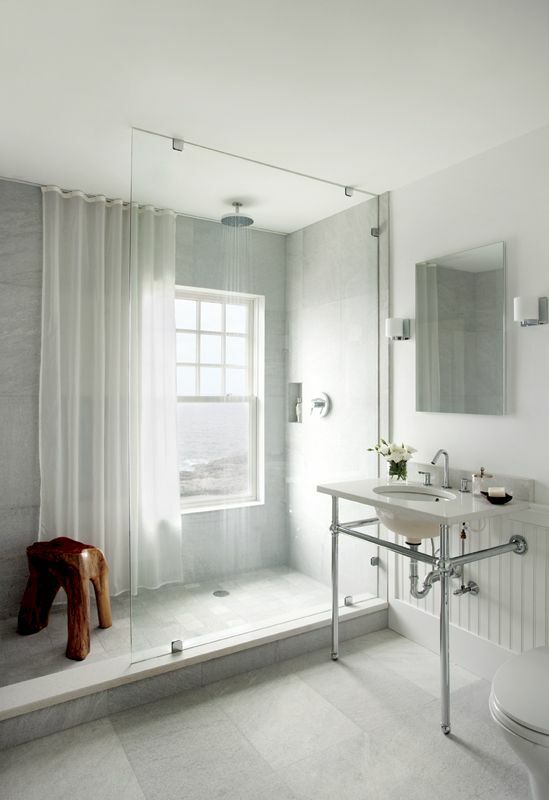 Not all shower room schemes have to be hyper-modern, this rustic shower room has bags of character. 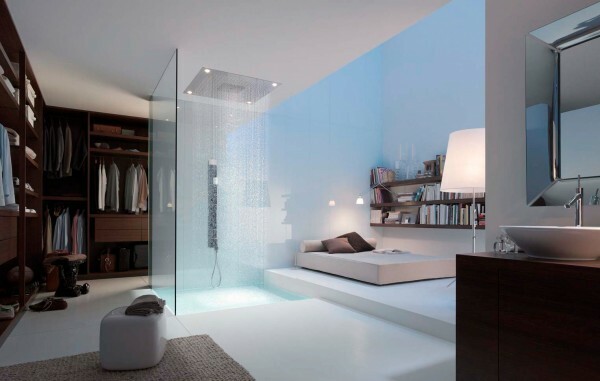 The dark ceiling in this space adds to the drama of a lit shower stream.